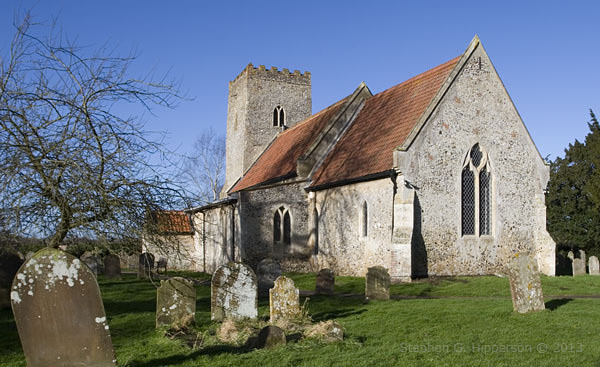 St Mary and All Saints, Little Melton, Norfolk, is a small village church built in the 14th Century. Nowadays, many churches are locked during the week to cut down on vandalism and thievery. I’ve visited this one on a couple of occasions in the hope that it might be open, but been disappointed. Sometimes wardens or the ladies who do flowers are at work and they are usually happy to act as informal chaperone – I don’t like to make special arrangements, disturbing people from the normal business and making appointments and the like . 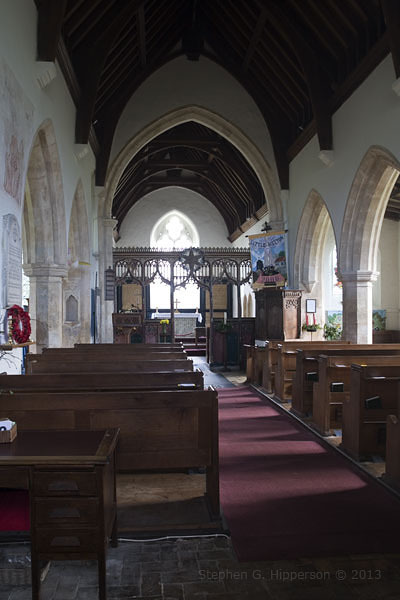 On my recent trip to Norfolk my luck turned and I found the church was indeed open, so I was able to take a few shots inside. 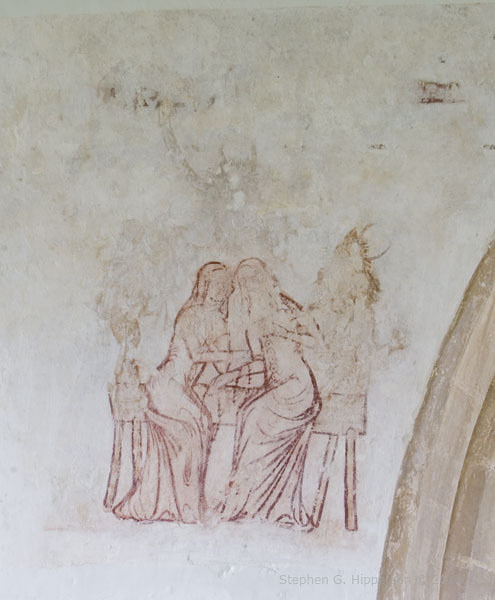 The first things to strike the eye are the 14th century wall paintings. In places the floor is particularly uneven. 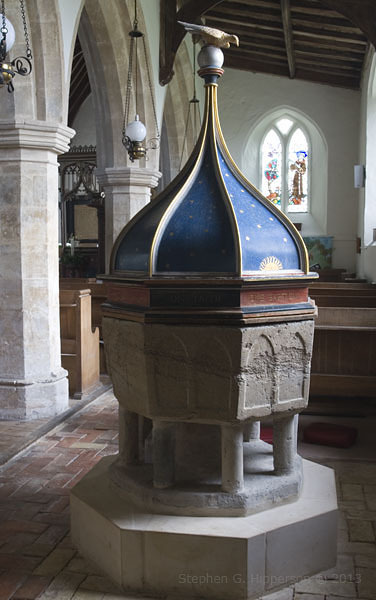 It was likely that this is the very font that my Great Great Grandfather was baptised in 1830s. I have some idea of names and dates of individuals who make up my paternal family line but not a real understanding of where – though I believe a 20 mile circle would adequately cover their locations back to 1600s. 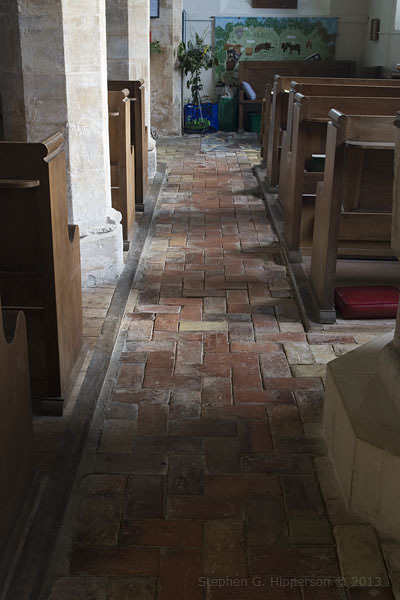 I plan to make further photographic trips to get some images of the relevant churches concerned – as these are most likely be substantially equivalent between then and now. 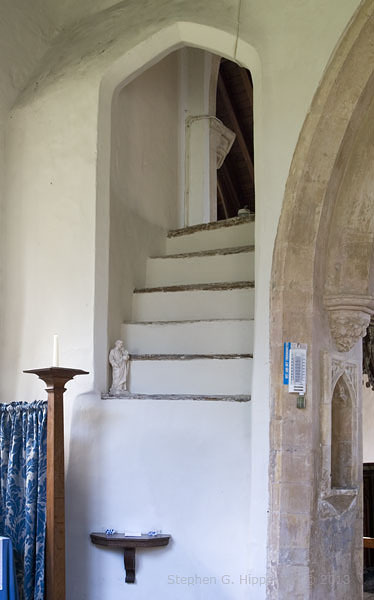 At some time in the past there looks to have been a rood loft – only the stonework remaining. Perscina and sedilia seem pretty typical to me. 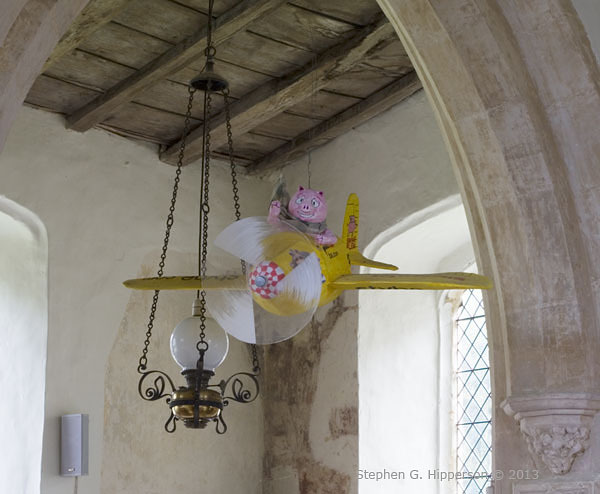 And who said pigs don’t fly! Don’t ask – I have no idea!! 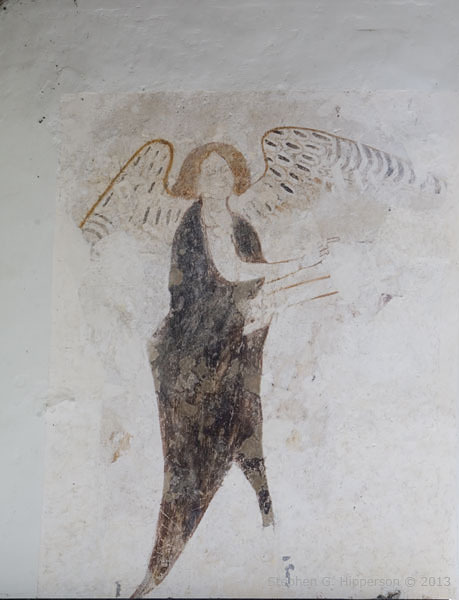 This entry was posted in Architecture, Churches, Documentary, Photography, Photos, Still Life, Uncategorized and tagged Little Melton, St. Mary and All Saints, Wall paintings by Stephen G. Hipperson. Bookmark the permalink. Nice presentation of the church. Thanks for sharing! Great photos. I can feel the memories there. Thx for your detailed documentary and pictures! Great to see the shelves in their context! What a beautiful Church. I’m glad you got lucky. 🙂 It’s a quiet little church but it’s clear it’s well loved. 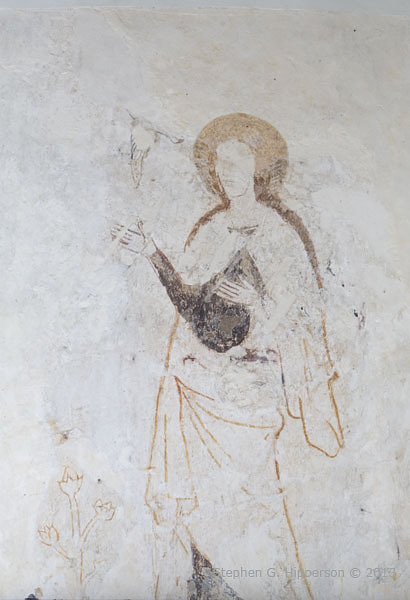 Wonderful images; I especially enjoyed the 14th century wall paintings. It’s always difficult to know how to present this type of painting. It’s easy to get carried away with artificial enhancement with photoshop and the like – but I’ve left them so as to represent pretty much how I remember they appeared to me. These are really lovely Stephen. Lovely! My heart hopped with recognition as I saw the exterior photo (and a couple of times on the interiors). Not that I’ve ever been to this one, but am very familiar with some of its many twins and siblings which occupy the quieter corners of England. 🙂 I know what you mean, they certainly give a sense of place – time stood still perhaps. They are like people – we categorise them by style and region – but it’s not until we get to know them as individuals that we come to realise their true persona. 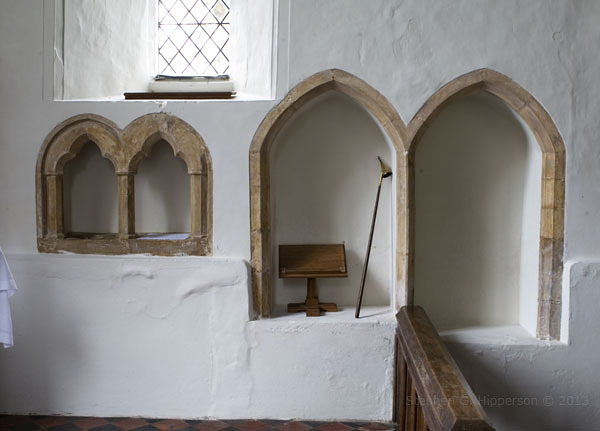 What a lovely little Church and some simple but sympathetic images. Also, if you’ve ever thought of researching your family history – do it! It’s incredibly compulsive and, with a bit of luck, very rewarding. 🙂 – I have thought about it and I know a fair bit has been done – I know my paternal tree back to the late 17th century. But that is from a superficial name/dob/dod point of view, what I’d really like to do is visit the neighbourhoods in which the lived and get a sense of place – unfortunately, as I intimated in my post, whilst the movement of my ancestors was restricted to less than a 20 mile diameter circle that circle is nearly 200 miles from my current address, so visits are few and far between (and usually filled with visiting ‘the folks’). There’s already one mystery woman in my tree but to investigate further I would have to look at the physical records – again, some distance from where I am. Wonderful photographs of an amazing structure. How fantastic that you have the possibility to visit the places so many generations of your forebears visited! The idea that they may have viewed those very same wall paintings would be mind-boggling. Indeed. Whether my ancestors were particularly religious I wouldn’t know, but I know of their Christenings in the font from the Baptism records. Wikipedia has a reference to there being an organ at All Saints.. do you recall one at all? I don’t, sorry. 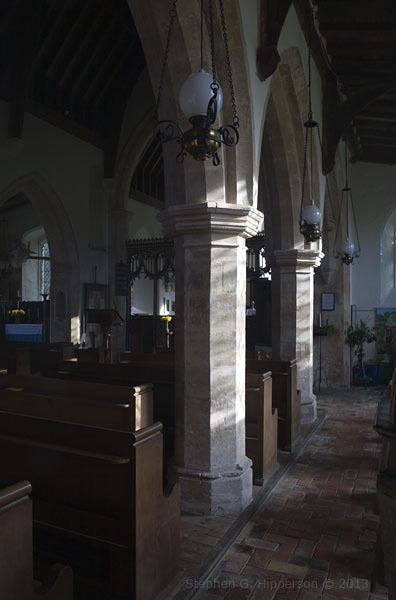 I’ve reviewed all the photos I took at the church and can see no evidence…. HOWEVER… you may be interested in the photos shown in one of Simon Knott’s web pages at http://www.norfolkchurches.co.uk/littlemelton/littlemelton.htm . Excellent! Thank you.. there is a photo of it at the west end of the church in the bell tower… a nice bright green!!! I wonder how they got that past the church authorities 🙂 Incidentally the organ was built by one of the sons of Zechariah Buck who was organist & choirmaster at the Cathedral from 1819 -1877. Very many thanks for your prompt reply.